Remember when action figures came with cardboard cutouts you could display them against? Well, as figures have evolved and become more and more detailed and extravagant, so have the dioramas... leading us to the sheer insanity that is a three hundred dollar door for Sherlock action figures. Big Chief Studios don’t just make pretty 1:6 scale action figures for Doctor Who, they also have the license to make figures for Steven Moffat’s other BBC hit, Sherlock. Big Chief expanded their Who line into display pieces with their absolutely incredible TARDIS, but now that figures for both Holmes and Watson have been released, there’s now... well, a door to put them buy. 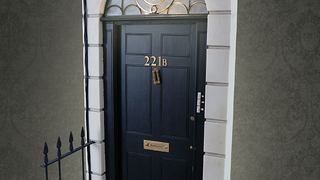 This 21 inch tall replica of the famous entryway to 221B Baker Street from the show is designed to be in scale with the previously released Sherlock figures, and comes with a variety of features (HOW DOES A DOOR HAVE FEATURES) - a working door handle and letter box, and a light up window on the top of the door. But get this. They’re selling you a door and it doesn’t actually work as a door oh my god what is is this what has the world come to. On top of being a door that isn’t actually a door — a faux door, if you will — the 221B Baker Street diorama sets you back a hefty £190, or just under $300. I mean, lets be real here: If I’m dropping 300 bucks for a door, I want the bloody thing to open up. Even if it doesn’t actually lead to anything behind it! This doesn’t stop getting any more ridiculous, does it? If you’re interested in pre-ordering the 221B Baker Street diorama, it’s available directly from Big Chief ahead of a release late this year.